I have mentioned so many times before how much I LOVE Newman's Own Organics and I cannot help but recommend their awesome organic foods for any holiday party, gift or eating on your holiday travels! Check out my favorite products this holiday season! Pretzels have been around for a long time and there is a reason for that! They can be crushed for a pie base, eaten with dips of all kinds, added to nuts, dried fruit and cereal for homemade trail mix, coated in melted chocolate (fun to do with kids), or just a quick, healthy snack! Newman's Own Organics has a perfect pretzel for every occasion. In fact they have ten varieties to choose from. And since they're baked (not fried), their pretzels make a great low-fat, healthy snack with only 1 to 1.5 gram fat (no trans-fat). 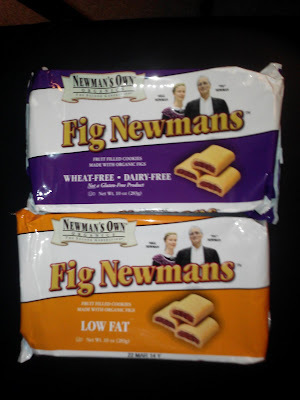 My husband's favorite product ever from Newman's Own Organics and favorite snack of all time are the Fig Newmans! The first fig bar made with organic figs, organic sugar, organic flour, and without hydrogenated oils was created. These cookies come in 10oz packages and can be found in natural food stores across the country. Each box contains three packets and is easily identifiable with the eye-catching design used on all the company's products, an American Gothic "Pa" Newman and daughter Nell with accompanying tongue-in-cheek legend. 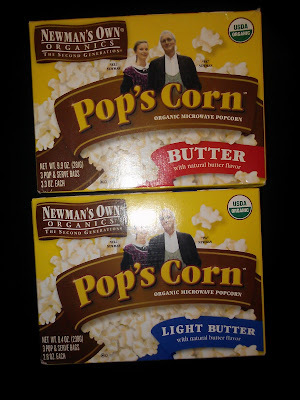 Pop's Corn features organic corn and organic palm oil. Consumers concerned about fat consumption will appreciate that no partially hydrogenated oils or trans fatty acids are used. Olive oil has many uses besides the traditional oil and vinegar dressing. This olive oil is produced in Tunisia and is extra-virgin, which is considered the finest and fruitiest of the olive oils. It's wonderful for dipping or grilling bread, drizzling over ripe, red tomatoes when in season, added to a hot vegetable soup just before serving, using with pasta sauces, sautéing vegetables, cooking meats, making fresh mayonnaise, pestos, hummus, and so many other dishes. This is one product that will be become a daily staple for you. It definitely has for ME! And my favorite snack is the dried fruit from Newman's Own Organics! The dried fruit line is 100% organic and contains no sulfites. Dried fruits have gone beyond their traditional roles and are now replacing high-fat, high-sugar snacks and drinks. Prunes, once thought of only for the older set, are being touted for their high antioxidant qualities; second only to blueberries. Raisins, always a treat, have made the leap from the lunch box and oven to trail mix, granola, and other mixed snacks. Apricots are a healthy, delicious treat right out of the package. Or, try adding them to yogurt, cereal, salad, or desserts. All can be used to add a special flavor to today's ethnic recipes and family favorites, as well as continuing to be a staple for bakers. Win It: Newman's Own Organics is generously offering (1) Prize Pack consisting of Dried Fruit, Fig Newmans, Olive Oil, and Pop's Corn to a lucky winner!